Ok, I’ll admit it. My name is Bryan Kluger, and I’m a Young Adult Movie virgin. I’ve never seen a ‘Twilight‘ movie nor have I seen either of ‘The Hunger Games‘ yet. And to be perfectly honest, I have not yet read any of these books that the movies were based on. Part of it is that I never got around to it while another part was that these stories didn’t really interest me. With ‘Twilight‘, my personal preference is to have my monsters whether they be vampires or werewolves, go on a nightly bender, wreaking havoc and killing for blood, only to have a hero stop their evil thirst and put them in their place. They are not to have vampires who wear glitter and talk about their feelings for three hours. It just doesn’t make sense to me. And with ‘The Hunger Games‘, while I’ve heard that these films are actually very well made and entertaining, I can’t but draw glaring similarities to the 2000’s Japanese film ‘Battle Royale‘. I know they two worlds are different, but the overall tone and story are the same. And I find myself saying when someone wants to watch ‘The Hunger Games‘, “I’d rather be watching ‘Battle Royale‘, and we end up not viewing it. That’s not to say that I won’t ever see these films, specifically the latter, they just don’t turn me on so to speak. Well now we are in the year 2014 and we have another Young Adult book series headed for the big screen by author Veronica Roth, which has already been optioned for three separate films. The first book and film is called ‘Divergent‘ and is set on Earth in an undefined future, where it seems people live in war-torn cities after some sort of war with who knows what. You can say ‘Divergent‘ popped my Young Adult Book series movie cherry. This “so called” epic tale, or at least first chapter in the film series is toned with teenagers discovering who they really are amid all the teen angst issues that would arise in this dystopian future. Director Neil Burger, who made ‘The Illusionist‘ and ‘Limitless‘ has shown us he can make a solid and entertaining film, but was he up for the job on a big-budget franchise movie? No he wasn’t. 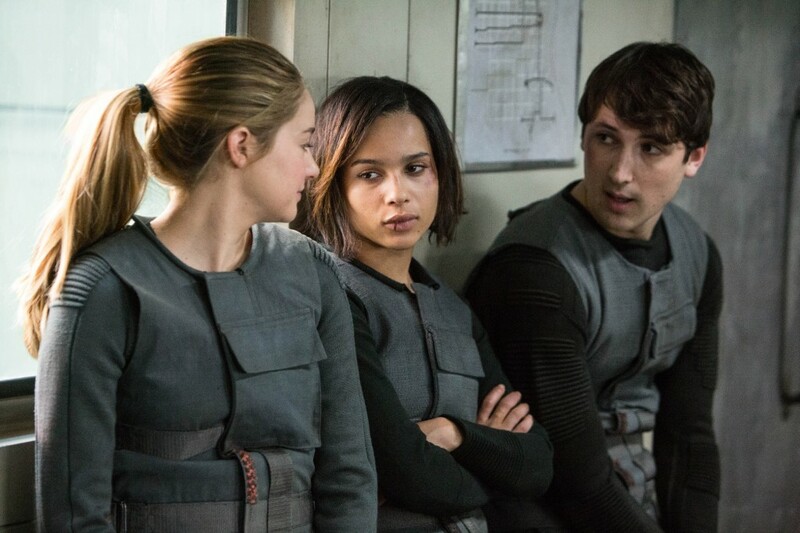 ‘Divergent‘, much like what it means to be a Divergent, never finds its pacing, story, or place in its 140 minute run-time, which is way to long in this case. The movie is unorganized, clunky, awkward, and cheesy. It never delivers a suspenseful atmosphere or on the gritty-mature nature of the story that it prides itself in having. Sure, it might have these aspects in the book version, but it is non-existent on film. I’m sure the word-of-mouth of this movie was not persuade movie-goers who are not familiar with the books to venture out and take a look, but those die-hard fans are sure to turn out in droves to see the hot male actors deliver their favorite lines. Again, the story takes place sometime in the future in a war-torn Chicago, where the remaining survivors of whatever happened are put into different factions to live and contribute to society at the age of 16. Each faction does something different whether it be lead, help others, grow food, or provide security. Much like when you’re a teenager, trying to fit in to a certain group or discovering your true identity, each 16 year old is given a sort of test with hallucinogenic drugs that will tell them which faction they will most likely be in, which our main star Beatrice or Tris for short (Shailene Woodley) is labeled as a Divergent, which is bad news for society, as she doesn’t exactly fit in with any faction. This means she can think on her own and not follow orders. People are supposed to report Divergents so they can be killed, but on the big ceremony day, these teenagers choose which faction they join for the rest of their lives. Only in this future, once you choose your faction, you can no longer see your family again if you choose a different faction from theirs and the one you grew up in. This isn’t really explained in logical terms and doesn’t make sense. Tris was born into the Abnegation faction, which is a peaceful and humanitarian group of people who lead the rest into a good future. But Tris seems to like the Dauntless faction, which provide security for people, and are loud, fun, and look like punk rockers. Hell, the way the even arrive looks fun as they jump off a moving train and and walk into the Choosing Ceremony like they were in some rock/rap music video, while the rest of the factions are in colored long robes, resembling a court judge. Upsetting her parents (Ashley Judd and Tony Goldwyn), Tris chooses Dauntless while her brother Caleb (Ansel Elgort) chooses Erudite, the faction that is all business and led by Jeanine Matthews (Kate Winslet), who is quite good as a villain here. As soon as Tris joins her new faction, she and the rest of the recruits start training in the underground tunnels of a train line which is now home to the Dauntless. 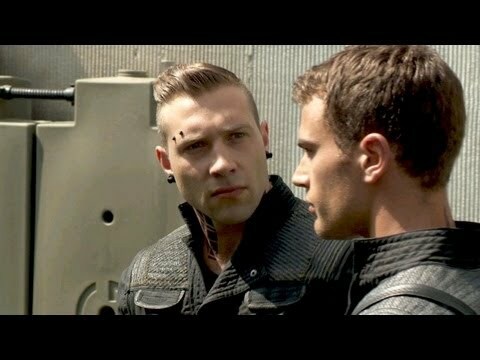 Since the Dauntless are the “police” of this new world, there is a lot of physical training to go through, which is led by Eric (Jai Courtney), a rough no-non-sense man who would kill his best friend in a blink of an eye. 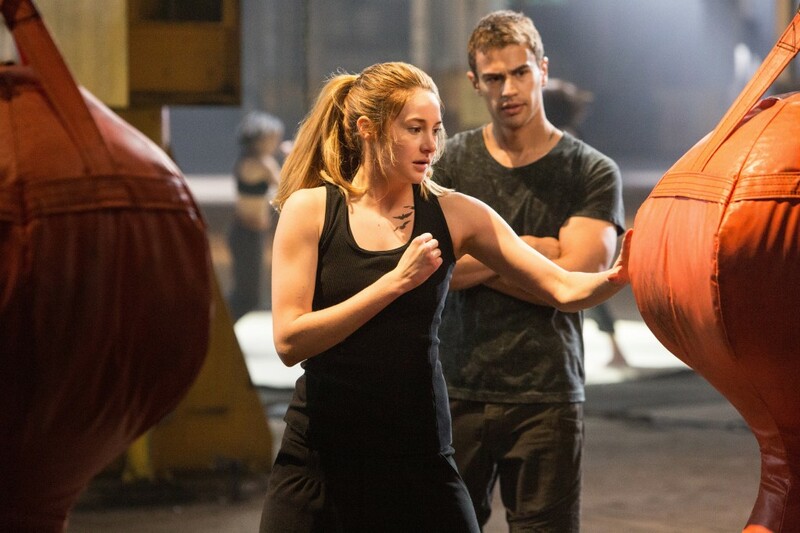 After the first hour of Tris going through physical exercises that would make a marine think twice and some full-contact fights with the other recruits, Tris realizes there is something much more sinister at work here than protecting the people. One of the leaders of Dauntless is called Four (Theo James), and notices something different about Tris on how’s she’ not like the rest. Four administers a series of more hallucinogenic tests to look for her fears and to see how she deals with these situations. But her test results always prove that she is a Divergent, but of course Four and Tris are attracted to each other so nobody finds out. We come to find out half way through the film that the Erudite faction is planning a takeover Nazi-Germany style by drugging the Dauntless into soldiers and killing every man, woman, and child that belongs to the Abnegation faction. Now Four and Tris must make out and destroy the Erudite faction’s plans before blood is shed, all while they are under everyone’s radar. This PG-13 movie never gets to gritty for people under thirteen, but it so desperately wants to be that. 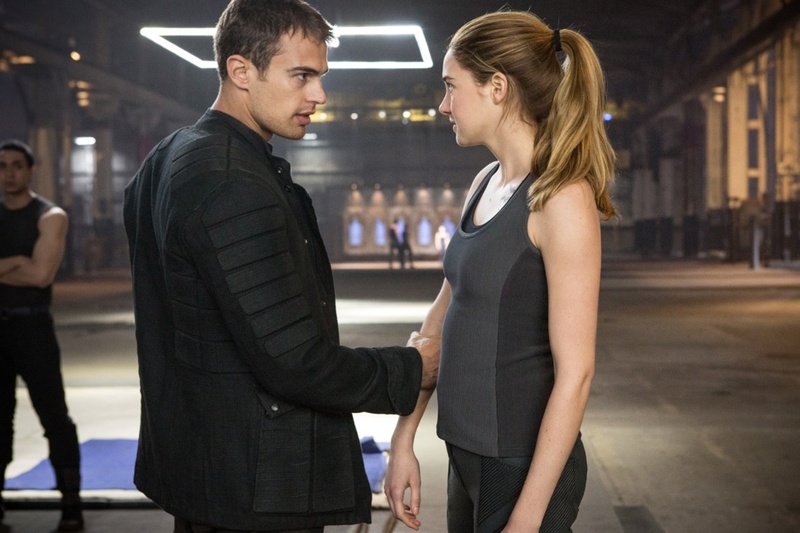 The interactions between the characters are clumsy and are not given enough time to feel any real emotion for when something drastic happens with the exception of Tris. There aren’t really a whole lot of good fight scenes or big special effects either. This first installment in the ‘Divergent‘ series seemed like one big 2.5 hour set-up for something bigger, that ultimately won’t pay off. 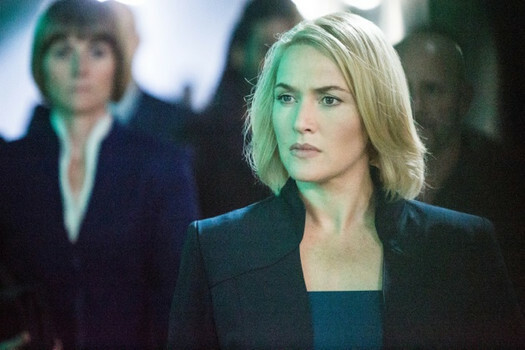 Woodley and Winslet are the best here as Winsley delivers her character with a vicious angle and Woodley gives a great and charming performance like she always does. A lot of people are saying that Theo James turns in a great performance here, but they are all wrong. His performance is one-note, boring, and has no energy. If this movie was James’s demo reel, I would not cast him in anything in the future. Miles Teller, Jai Courtney, Mekhi Phifer, and Zoe Kravitz all turn up here as well, but aren’t given a whole lot of screen time. But Teller as always is hilarious and great on-screen. The filming isn’t that great either and seems like a paint-by-the-numbers shooting script than anything that would force us to think or entertain. The score by Junkie XL is uninspired even though Hans Zimmer was credited as an executive score producer, and it never adds to any emotion or suspense happening on-screen. I hope the second film is leaps and bounds better than this first one, because I’m sure it will lose steam very fast at the box office with this type of filmmaking. I guess ‘Divergent‘ has nowhere to go but up. P.S. – Check Out My Quick Interviews with Jai Courtney and Miles Teller by clicking HERE for Jai Courtney and HERE for Miles Teller!! This entry was posted on Thursday, March 20th, 2014 at 12:17 pm	and is filed under Film, News. You can follow any responses to this entry through the RSS 2.0 feed. You can skip to the end and leave a response. Pinging is currently not allowed. People who say the Hunger Games are a ripoff of Battle Royale are trying too hard to reaffirm that they are hip and cool. You can say every movie is a derivative of another. Just admit you’re not interested and save us from the ego trip. Trey, Most of us saw Battle Royale ten years prior to when Hunger Games wasn’t even a thought in the author’s mind. The similarities are glaring. I know they are different films in different worlds. The point is that these Young Adult novels today are dumbed down way to much and are lazily written. Who exactly are “most of us” ? 18 months ago I hadn’t heard of BR or HG, despite having been an omnivorous fan of screen and print since the mid-70s (I’m in my mid 40s now). Now I’ve seen both movies and read both books. Neither one is unique in any way whatsoever. Stories involving dystopia, child sacrifice, and forced mortal combat have been around for thousands of years. Please go watch “Everything is a Remix” online and spare us the internet pollution of yet another whiny, ignorant weeaboo. « Film Review: ‘Muppets Most Wanted’! !